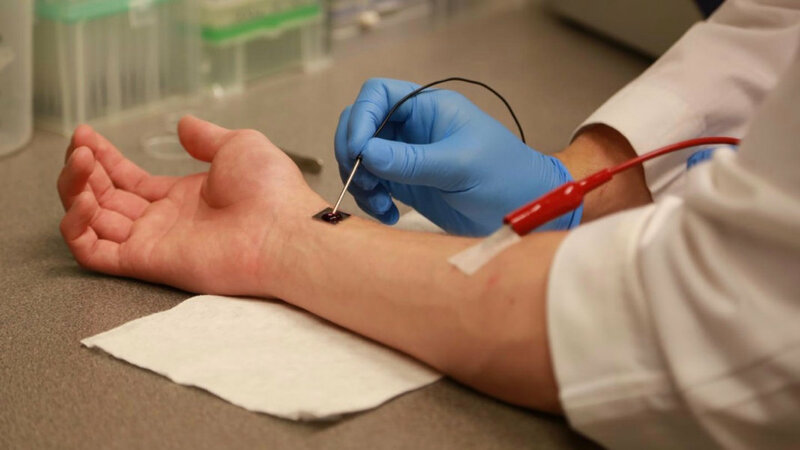 It sounds like science fiction: with a light zap of electricity, a tiny stamp-like device transforms your skin cells into reservoirs of blood vessels or brain cells, ready to heal you from within. Recently, a team of medical mavericks at the Ohio State University introduced a device that does just that. The technology, dubbed tissue nanotransfection (TNT), is set to blow up the field of organ regeneration. When zapped with a light electrical jolt, the device shoots extra bits of DNA code from its nanotube arrays directly into tiny pores in the skin. There, the DNA triggers the cells to shed their identity and reprograms them into other cell types that can be harvested to repair damaged organs. Remarkably, the effect spreads with time. The rebooted cells release tiny membrane bubbles onto their neighboring skin cells, coaxing them to undergo transformation. Like zombies, but for good. So far, the device has already been used to generate neurons to protect the brains of mice with experimental stroke. The team also successfully healed the legs of injured mice by turning the skin cells on their hind limbs into a forest of blood vessels. While still a ways from human use, scientists believe future iterations of the technology could perform a myriad of medical wonders: repairing damaged organs, relieving brain degeneration, or even restoring aged tissue back to a youthful state. “By using our novel nanochip technology, injured or compromised organs can be replaced. We have shown that skin is a fertile land where we can grow the elements of any organ that is declining,” says lead author Dr. Chandan Sen, who published the result in Nature Nanotechnology. The Ohio team’s research builds on an age-old idea in regenerative medicine: that even aged bodies have the ability to produce and integrate healthy, youthful cells—given the right set of cues. While some controversy remains on whether replacement cells survive in an injured body, scientists—and some rather dubious clinics—are readily exploring the potential of cell-based therapies. All cells harbor the same set of DNA; whether they turn into heart cells, neurons, or back into stem cells depend on which genes are activated. The gatekeeper of gene expression is a set of specialized proteins. Scientists can stick the DNA code for these proteins into cells, where they hijack its DNA machinery with orders to produce the protein switches—and the cell transforms into another cell type. The actual process works like this: scientists harvest mature cells from patients, reprogram them into stem cells inside a Petri dish, inject those cells back into the patients and wait for them to develop into the needed cell types. It’s a cumbersome process packed with landmines. Researchers often use viruses to deliver the genetic payload into cells. In some animal studies, this has led to unwanted mutations and cancer. It’s also unclear whether the reprogrammed stem cells survive inside the patients. Whether they actually turn into healthy tissue is even more up for debate. The Ohio team’s device tackles many of these problems head on. Eschewing the need for viruses, the team manufactured a stamp-sized device out of silicon that serves as a reservoir and injector for DNA. Microetched onto each device are arrays of nanochannels that connect to microscopic dents. Scientists can load DNA material into these tiny holding spots, where they sit stably until a ten-millisecond zap shoots them into the recipient’s tissue. “We based TNT on a bulk transfection, which is often used in the lab to deliver genes into cells,” the authors explain. Like its bulk counterpart, the electrical zap opens up tiny, transient pores on the cell membrane, which allows the DNA instructions to get it. The problem with bulk transfection is that not all genes get into each cell. Some cells may get more than they bargained for and take up more than one copy, which increases the chance of random mutations. “We found that TNT is extremely focused, with each cell receiving ample DNA,” the authors say. The device also skips an intermediary step in cell conversion: rather than turning cells back into stem cells, the team pushed mouse skin cells directly into other mature cell types using different sets of previously-discovered protein factors. In one early experiment, the team successfully generated neurons from skin cells that seem indistinguishable from their natural counterparts: they shot off electrical pulses and had similar gene expression profiles. Surprisingly, the team found that even non-zapped cells in the skin’s deeper layers transformed. Further testing found that the newly reprogrammed neurons released tiny fatty bubbles that contained the molecular instructions for transformation. When the team harvested these bubbles and injected them into mice subjected to experimental stroke, the bubbles triggered the brain to generate new neurons and repair itself. “We don’t know if the bubbles are somehow transforming other brain cell types into neurons, but they do seem to be loaded with molecules that protect the brain,” the researchers say. In an ultimate test of the device’s healing potential, the researchers placed it onto the injured hind leg of a handful of mice. Three days prior, their leg arteries had been experimentally severed, which—when left untreated—leads to tissue decay. The team loaded the device with factors that convert skin cells into blood vessel cells. Within a week of conversion, the team watched as new blood vessels sprouted and grew beyond the local treatment area. In the end, TNT-zapped mice had fewer signs of tissue injury and higher leg muscle metabolism compared to non-treated controls. “This is difficult to imagine, but it is achievable, successfully working about 98 percent of the time,” says Sen.
A major draw of the device is that it’s one-touch-and-go. There are no expensive cell isolation procedures and no finicky lab manipulations. The conversion happens right on the skin, essentially transforming patient’s bodies into their own prolific bioreactors. “This process only takes less than a second and is non-invasive, and then you’re off. The chip does not stay with you, and the reprogramming of the cell starts,” says Sen.
Because the converted cells come directly from the patient, they’re in an “immune-privileged” position, which reduces the chance of rejection. This means that in the future, if the technology is used to manufacture organs “immune suppression is not necessary,” says Sen. While the team plans to test the device in humans as early as next year, Sen acknowledges that they’ll likely run into problems. For one, because the device needs to be in direct contact with tissue, the skin is the only easily-accessible body part to do these conversions. Repairing deeper tissue would require surgery to insert the device into wounded areas. And to many, growing other organ cell types is a pretty creepy thought, especially because the transformation isn’t completely local—non-targeted cells are also reprogrammed. That could be because the body is trying to heal itself, the authors hypothesize. Using the chip on healthy legs didn’t sprout new blood vessels, suggesting that the widespread conversion is because of injury, though (for now) there isn’t much evidence supporting the idea. For another, scientists are still working out the specialized factors required to directly convert between cell types. So far, they’ve only had limited success. But Sen and his team are optimistic. Image Credit: Researchers demonstrate tissue nanotransfection, courtesy of The Ohio State University Wexner Medical Center.